MVHR (Mechanical Ventilation Heat Recovery) systems, sometimes reffered to as whole house ventilation systems, are getting a higher profile in domestic properties as their value in improving energy efficiency, removing stale moist air and in some cases filtering pollen and other airborne dust is recognised. This article explains what they do, what the components of a Mechanical Ventilation Heat Recovery System are and the reasons for their growing popularity in new and existing homes. Couldn’t I just open the windows or use an extractor fan? The simple answer is yes but the MVHR system allows you to control moisture and air changes throughout the day without losing a lot of heat energy. On a cold day you don’t really want all that lovely warm expensively heated air to disappear out the window or through the extractor fan. A wider consideration is that having fresh air is too important for people’s health to leave it to chance. Older houses rely on draughts and the opening of windows and doors to get fresh air in. 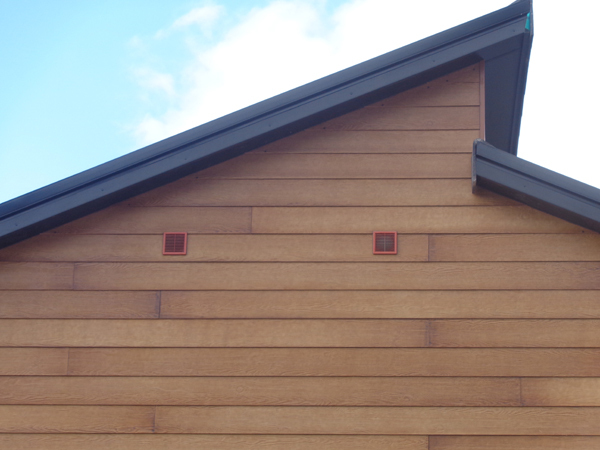 As homes become more and more insulated then the draughts are reduced but this also reduces the opportunity for moist stale air to be changed and replaced; the result can be the build up of damp and condensation. A MVHR system can help address this. 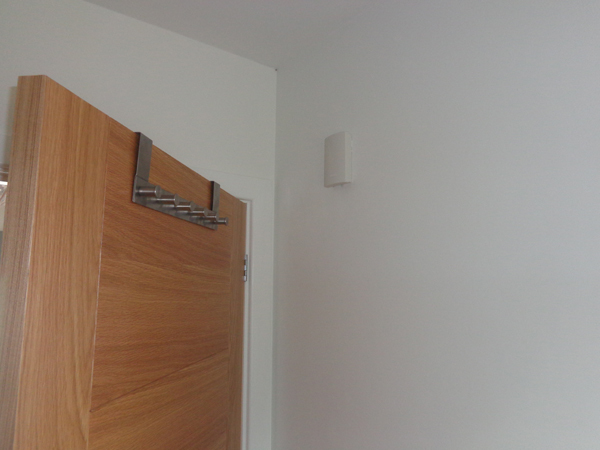 The inlet vent for a Mechanical Ventilation Heat Recovery system should ideally be about 2 metres away from the outlet and well away from a boiler flue. 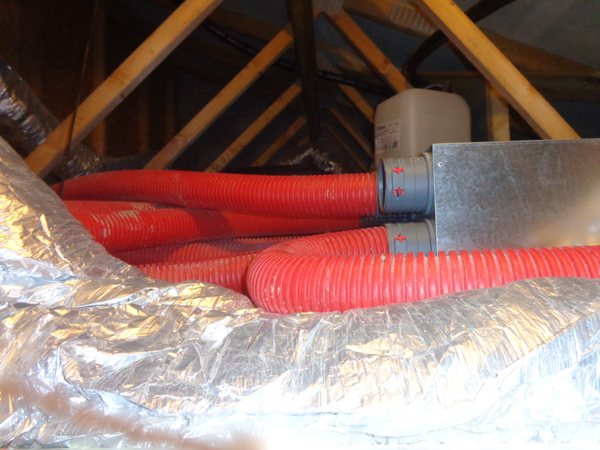 Semi-Rigid ducting (red pipes) feeds air round the system to each room as well as the outside vents. The semi-rigid ducting is connected to air distribution boxes (product shown is an Airflow 10-Port Distribution Box) which are themselves connected to the heat recovery system. Either an outlet or an inlet vent is installed in the ceiling of each room in the house. As humidity rises in the bathroom then the fan speed of heat exchanger unit increases to clear moisture quickly. 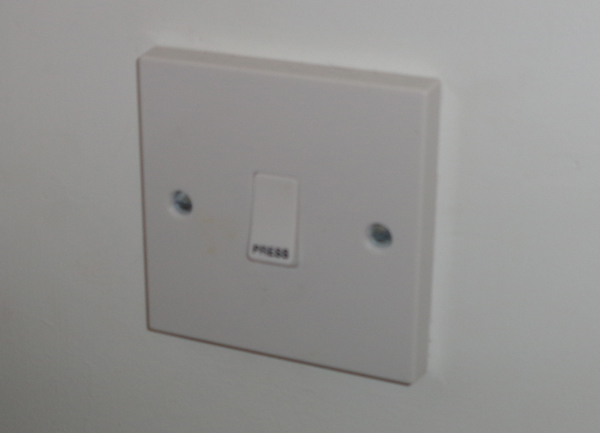 A boost switch for a kitchen. When pressed it switches the heat exchange unit to maximum fan speed for 30 minutes. Why are MVHR systems more common now? Best practice in building has changed over the years. 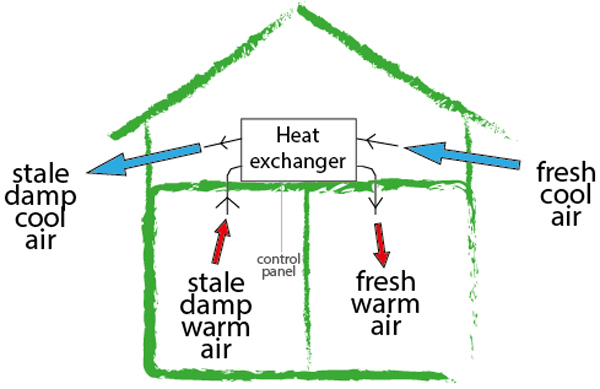 Nowadays highly energy efficient buildings (such as a Passivhaus) can be thought of as water and air tight well insulated boxes with little “natural” ventilation. 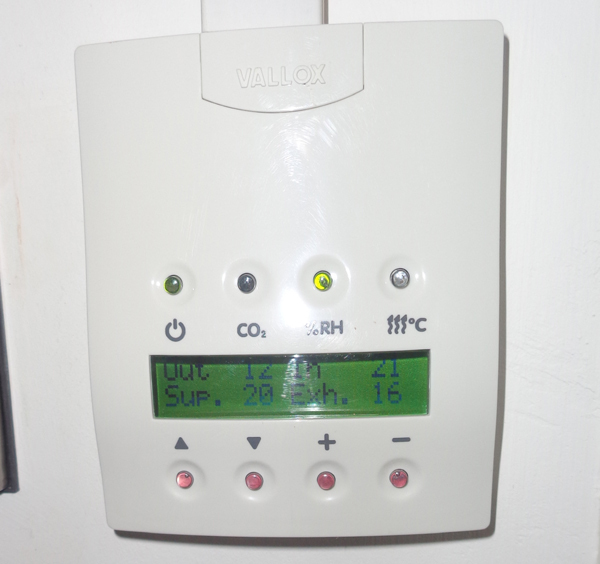 An MVHR system is a key element of this type of energy efficient building which can use a fraction of the energy used on space heating in a typical house (20% or less of what it costs to heat a typical house). Traditional houses were not designed to be water or airtight. They were often built with solid walls so rain falling on the outer skin of the house could find its way to the inside. To make sure that damp did not build up there was often lots of natural ventilation (otherwise known as cold draughts) through the floors, windows, doors and roof. Despite this some more traditional homes still suffer from damp and mould due to lack of adequate ventilation. As energy costs have risen and people want more comfort the trend has been towards increased insulation measures, cutting natural ventilation and creating more damp and condensation problems. Some traditional homes, often those that are having a major renovation, have an MVHR system included as part of the upgrade. This allows insulation to be improved and can also help tackle problems with damp and condensation. What are the benefits of an MVHR system? What does an MVHR system cost to maintain? 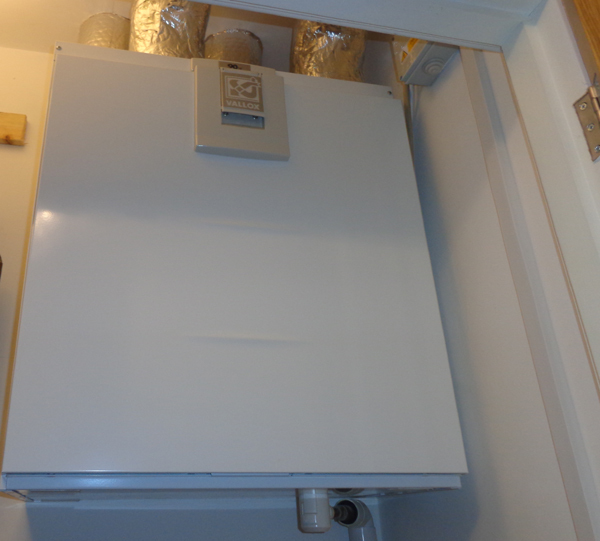 It is generally recommended to clean or change the filters in the MVHR unit once or twice a year. This is quite a simple task to do and would take around 15 minutes. Depending on the unit, replacement filters will cost around £25 so replacing twice a year would cost £50 plus any labour costs. What is the air quality like with an MVHR system? MVHR systems provide a high quality of air throughout the home. As the air is filtered before being distributed it also tends to be dust free. It does depend on the unit but the Vallox 90SE has two filters on the inlet and one on the outlet. The inlet filter is a G3 and then an F7 filter. There is also a G3 filter on the exhaust air. The G3 is a filter for coarse particles and dust whilst the F7 is for finer particles. Hay fever suffers should benefit from pollen being filtered out of the air. Are there any things to watch out for on installation? It is important that the system is installed in line with the manufacturer’s instructions and latest best practice. Where ducting or other parts of the system run outside of the insulated area of the building, such as in an unheated roof space, then components should be well insulated. 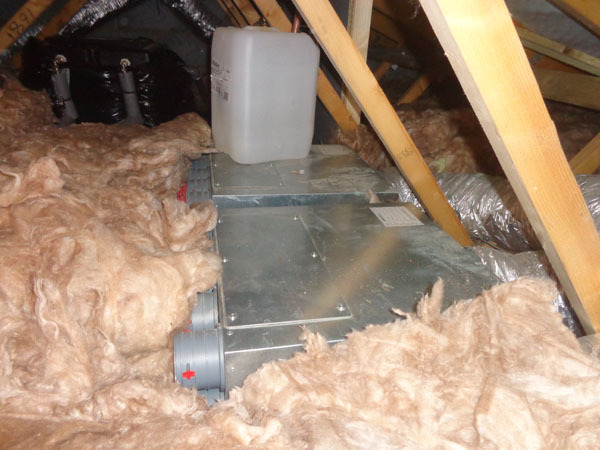 The air distribution boxes shown in the roof space picture have not been insulated, resulting in heat loss and colder air being piped into living areas.This was remedied using space blanket insulation covering the entire unit. When using semi-rigid ducting it is important that this is not compressed. A heavy boot or two treading on the ducting can squash it, reducing its capacity to distribute air.